The beach on Yangol'apl'ap Island. “The story of Yongl’aab starts in Tamil, after the Flood. The father of Yongl’aab is Rigog. Rigog was a giant, staying in Tamil, and his father is Yuw. 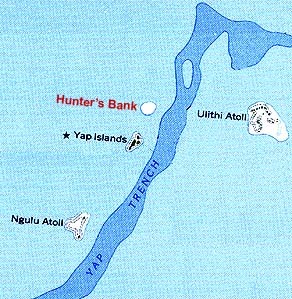 Yuw is a man from Sipin [“sunken island”], or Hunter’s Bank, which is north of Yap about 17 miles. There was an island there, an atoll that has since disappeared. So now there is no land, only the coral is there now. "The mother of Rigog was Pingalog, Pingalog was a woman who came from Ngolog village in Rull municipality, and she married Yuw. Yuw married Pingalog, and they stayed in Tamil, in Teb." Location of Hunter's Bank, where Sipin Island is said to have once resided. 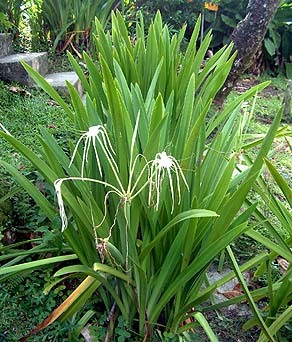 Giyab, the plant sent to the Outer Islands by Chigchig and Laplap. “The last one, they didn’t give him a name before he died,” Pitmag adds. 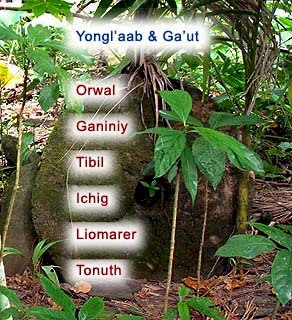 “This group was the children of Rigog,” Yaad continues, “And they divided the children across the island of Yap. Yongl’aab is the oldest and he was supposed to stay in Tamil, at their house, but Megragoy, he wouldn’t listen to the father; he said ‘No, I’m the one that’s going to stay here.'" "So they sent Yongl’aab to Gagil, to stay there and take care of the Outer Islands, and the father told him, ‘Yongl’aab, when you come to Tamil in the morning in the canoe, the sun is on your back, you cannot fish, cannot light your fish, and when you see us and in the evening when you go back, and the sun go in the back, And these people, when they come to your place in the morning, they come, the sun light is lighting in their face, just like in the evening when they come back.’ So this is what they told Yongl’aab, and they gave him the whole Outer Islands. “This whole Outer Islands, it was including Japan before. Japan, we call it Marwal. That’s our name for Japan. So before, the land of Japan was in our empire, all the way up to Truk, to Likiap Island (Marshalls? ), and coming down to Palau’s outer islands. That all belonged to us. They speak the same language as on the other Outer Islands." 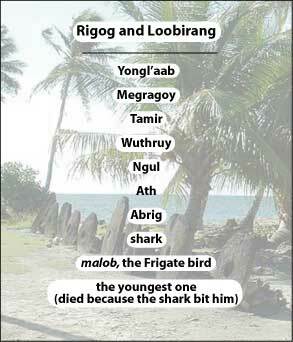 Children of Rigog and Loobirang. Placement of seven of the ten children of Rigog and Loobirang. “And they sent Tamir to Maap, to take care of Maap and Rumung. So Tamir is in Maap, taking care Maap and Rumung. Ngul, they sent him to stay in Makiy. Makiy is the biggest village in Gagil municipality. Ngul is taking care of Makiy, and they have a big tabu place there in Makiy. “And they sent Abrig to Malway, a village in Fanif. And this Abrig is really afraid of earthquakes. 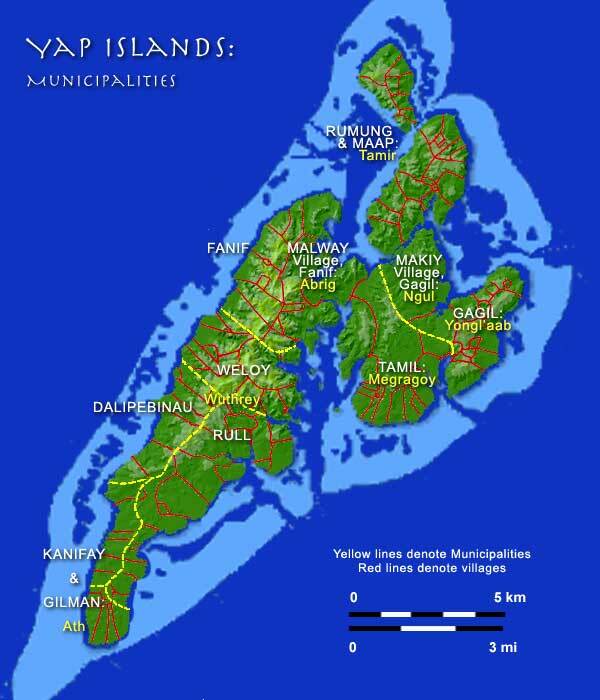 So Malway is the only village in Yap that doesn’t have earthquakes. When an earthquake comes, it shakes the whole island, but not Malway. Even now, it’s still the same. “And they send Wuthrey up to take care of Rull, Dalipebnau, and Weloy. And they send Ath to Nimgil. Nimgil refers to Kanifay and Gilman, these two districts." 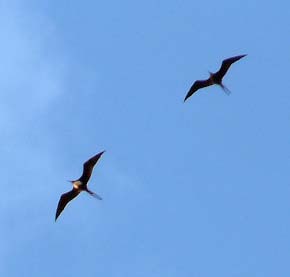 “And two more: the shark and the bird. They gave the shark to Ath to stay in Nimgil. And they give the bird to go with Yongl’aab. And Yongl’aab sends the bird, the malob, to the Outer Islands. And every year when the canoes come from whole Outer Islands to Yap bringing the tribute, there is the feather of that bird on the canoe fleet coming to Gachpar. That means Yongl’aab and the bird are going to meet again. They used to meet once a year. Children of Yongl'aab and Ga'ut. Background is the house platform at Numruy. “When Yongl’aab was sent to Gagil, they stayed in Ethoew’ and he married a lady from the high clan family, which is Tagbuy,” Yaad recounts. “The name of lady was Ga’ut. She’s from Tagbuy. Yongl’aab married her and they moved to Numruy, and they stayed in Numruy. That’s the most important place in Gachpar. 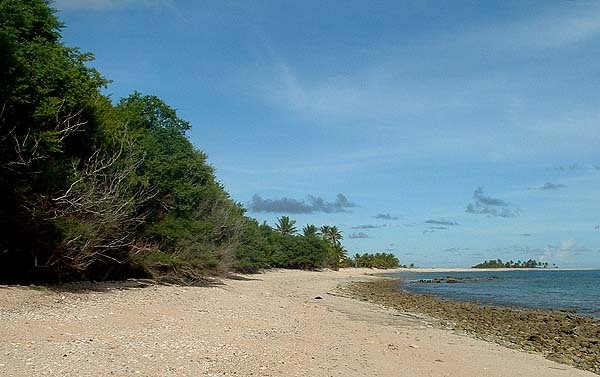 Now from Numruy platform the story of Liomarer begins, its events accounting for the first people of Ulithi Atoll. Read on as this tale unfolds the legendary setting for many things on Ulithi, and its relationship with Yap.